Yogyakarta always presents a different atmosphere from other places in Indonesia. Apart from being famous for the student city, Yogyakarta turned out to also store various unique and interesting tourist attractions to explore. Lots of tourist attractions in Yogyakarta that can be visited ranging from the coast to the highlands. Of the many tourist attractions in Yogyakarta, there are several tourist attractions that are quite unique and challenging adrenaline. If you are a traveler with an adventurous spirit, then some of Yogyakarta's following tourist attractions must be visited for adrenaline. The beach located in Gunungkidul is indeed very exotic with different sensations on each beach. 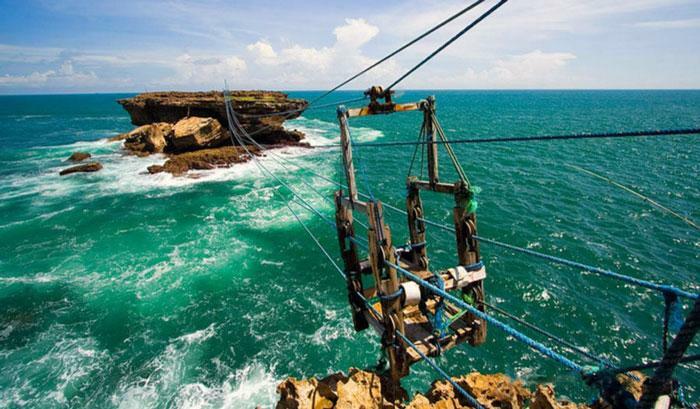 Of the many beaches in Gunungkidul, there is one beach that is quite unique namely Timang Beach. The beach which is located in the south of Wonosari with a distance of about 35 km offers a different view from other beaches in Gunungkidul which is the view of the waves crashing into the reef. The south coast wave that is famous for being big enough when it hits the reef will produce a very beautiful scene and a distinctive sound. Besides being able to enjoy exotic views of the beach from the outskirts, visitors can also enjoy the view from a small island called Watu Panjang Island. To go there, visitors must ventured to ride the cable car whose rope is made of ordinary rope. Your adrenaline will be spurred when you are in the middle of the track with a minimum safety and strong wind. This cable car is not recommended for visitors who are phobia of height / twitching because this vehicle is quite dangerous. To board this train, visitors are required to pay 200,000 rupiah. When you arrive on the island of Watu Panjang, your fear will be paid off because the scenery is very beautiful and you cannot find it anywhere else. Maybe for tourists this one place is no stranger to the ear because Kalibiru is a very popular tourist spot. 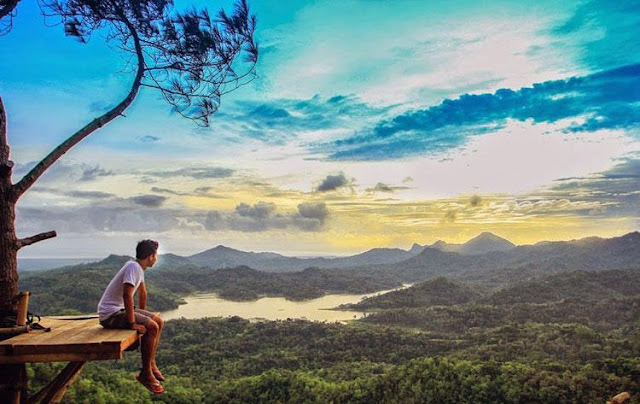 Kalibiru at the same time became the pioneer of new tourism, namely a viewing post that was above the tree. 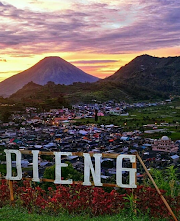 This tourist spot is indeed far from the hustle and bustle of the city of Jogja so that many tourists come here to enjoy the beauty of nature as well as to calm the mind for a moment. 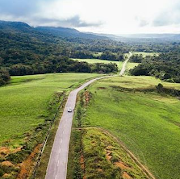 Kalibiru Nature Tourism is located in Menoreh Hills, Kulonprogo Regency with an altitude reaching 450 mdpl so that the air in this place is quite cool. 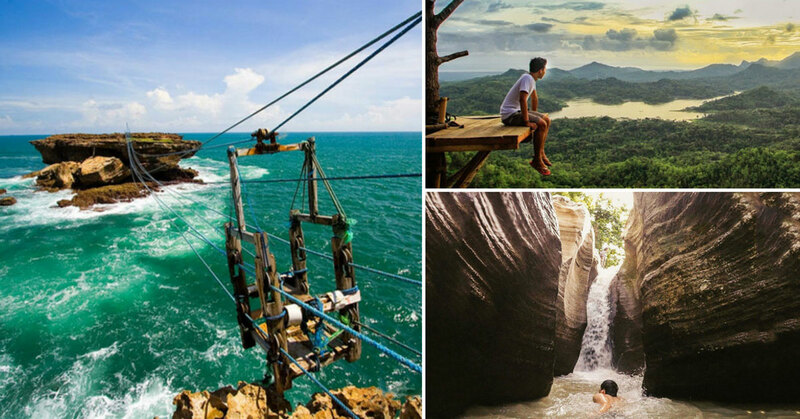 In this place, visitors can do various activities such as enjoying the natural scenery from above, flying fox, crossing a suspension bridge, and others. When visiting this place, don't forget to take pictures. 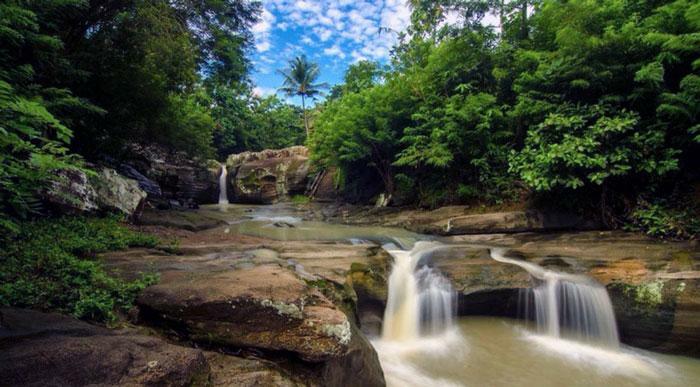 To enter the Kalibiru Nature Tourism, tourists must pay an entrance ticket of 5000 rupiah. While for tourists who want to make an outbound, tourists can pay outbound packages worth 35,000 rupiah. Who says the desert only exists in Africa / Middle East countries. 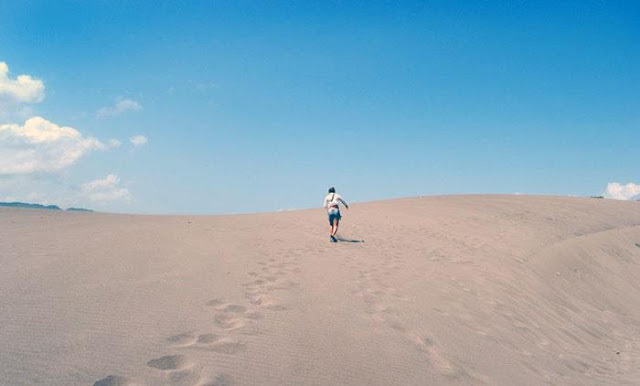 You can also find this vast expanse of sand in Yogyakarta precisely at Gumuk Pasir Parangkusumo located on Jl. Parangkusumo Beach, Kretek District, Bantul Regency. When you visit here, you will see a vast stretch of sand. The most popular activity in this place is sandboarding or gliding using a board on sand. You can slide from the hill to the bottom using the available board. This activity is enough to trigger adrenaline because the speed of this skateboard is fast enough with sand challenges that can make you slip and fall. In addition, tourists who visit can also rent ATVs or horses to tour the desert. Its unique and beautiful place is also often used by couples who will marry as pre wedding locations. Turning to a tense and refreshing water tour, you can travel north to the Luweng Sampang Waterfall in Sampang Village, Gedangsari District, Gunung Kidul. This tourist attraction is indeed quite close to the border of Klaten so it is faster to reach via Jogja - Solo roads. Curug Luweng Sampang is a waterfall that is very unique because the rock cliffs that surround this waterfall have a very unique motif. The pattern in the waterfall is formed due to the flow of the river so that the motive is very natural. This waterfall has very cool water because it comes from Sewu Mountains. If you visit this place, it's less like it if you don't throw yourself into the waterfall pool to refresh your body after the trip. You can swim near the waterfall to get a unique view because there is a hidden niche. This one tourist spot is still new so there are not many tourists who know the exact location of this place. If you want to go to Curug Luweng Sampang, do not hesitate to ask the surrounding community to show the way. It turns out that Yogyakarta also has a well-known and unique cave tour called Jomblang Cave which is located in Semanu, Gunung Kidul. This cave is a unique cave with a sinkhole or a large vertical hole. This cave is still very natural and maintained its ecosystem so that when you visit this place, you will find very fertile moss and plants. When you try to go into the cave, you will feel high enough humidity coming from the cave wall and also the trees around. Of course this makes your adrenaline trigger and create a new experience. 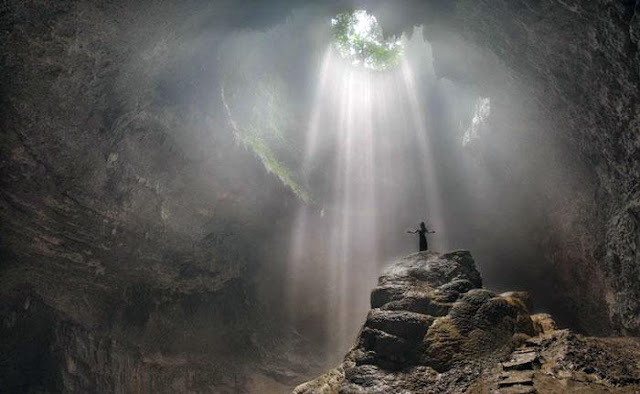 If you want to see the most exotic scenery in this cave, come at 10 am to 2 pm because you will see a view of the sun that breaks through the hole in the cave so it will look very beautiful. You can capture the moment by taking a selfie or taking a photo on the mound under the hole. But you need to know, the number of people allowed to enter the cave is very limited to maintain the preservation of the vegetation in it. It is highly recommended to make a reservation before leaving so that you will not be disappointed when visiting this tourist spot. 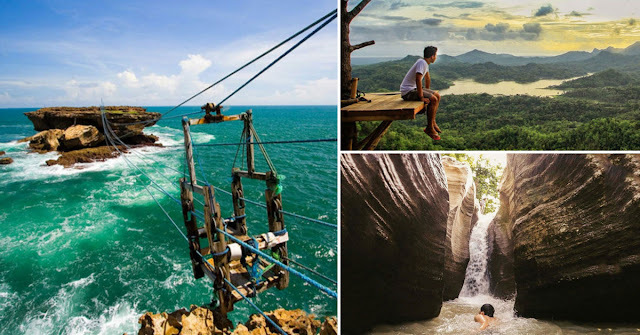 To be able to enjoy tourism that is quite challenging and enough to make this dirty body, visitors will be charged an entrance ticket of 450,000 rupiah. Such are some recommendations of Yogyakarta tourist attractions that are challenging and trigger adrenaline. Of course by visiting some of the tourist attractions above, then your vacation in this Student City will be more different because you will find new things and new experiences.